Useful for portraying characters who are asleep, knocked out, dead or sunbathing. The lass on the bottom row is Lyuba by Svetlana Kushnariova a.k.a. Cabbit. The others are based on her big character pack. 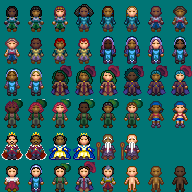 The Queen and the characters with the medium skin tone are in my extended version while the black characters are in a seperate black character pack because I made them later. Atribution 3.0 License and a OGA-BY 3.0 license. If this page is still around when you publish your project, please link back here or provide the URL. On the pages of Cabbit's works that this is based on, she asks to be credited as Svetlana Kushnariova and to give her email address, lana-chan@yandex.ru, so you'll need to do that too. They are great, all of them. diamonddmgirl, thank you so much for your work. It's really great and I'm honored that you've used my graphics as a base. Actually when I see your works, I become more motivated to draw something myself. Thanks and you're welcome. I look forward to seeing what you'll make. Would you be willing to do additional lying down sprites in all directions? N-S, S-N, E-W, & W-E?